← District 12 International Speech Contest – Part 1 – What a Grandastic Adventure! I love this week’s Daily Post photo challenge: Twisted. 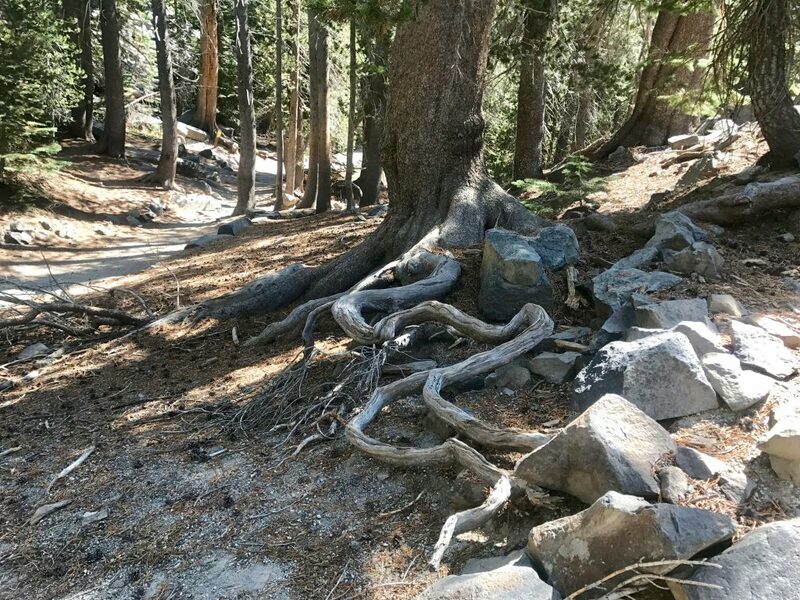 Aren’t these twisted tree roots cool? This is by Devil’s Postpile in the High Sierras near Mammoth, California. 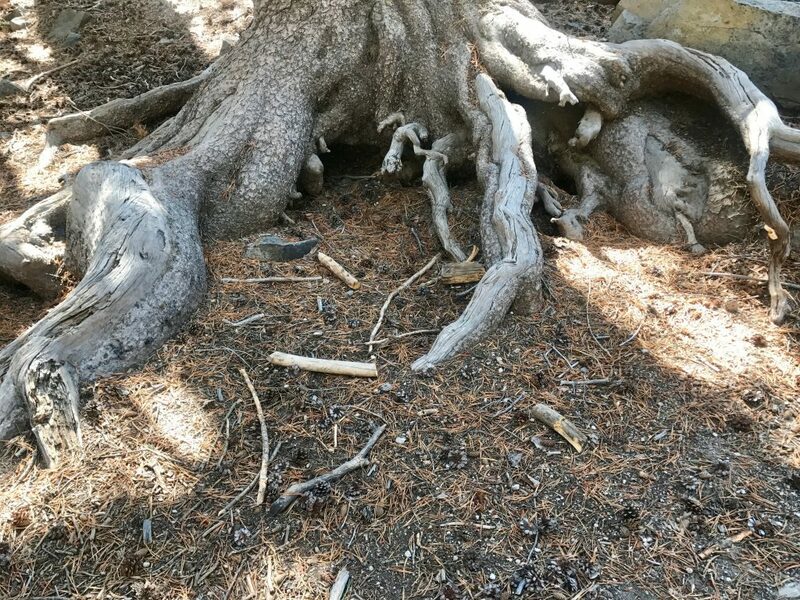 While my son Mike and daughter Amy hiked up the trail to check out the top of the Devil’s Postpile, George and I sat on a fallen log near the trail and enjoyed the chipmunks and peaceful calm of the forest. These tree roots caught my eye. I like survival shows like Naked and Afraid, so when I’m in a wilderness environment, I always wonder if I could survive if I was stuck there for a while. My imagination had a field day planning how to build a shelter by covering the tree roots with branches and leaves. The closer to the ground, the better, to keep warm and snug. This huge trunk would make me feel safe and secure if I huddled up in its nook. I even figured it offered enough space for a few people to join me. This was a beautiful spot to meditate on the wonders of nature and ponder my survival skills! What are your thoughts? Do you like survival shows? Do you like to hike on wilderness paths? Do you appreciate nature’s artwork? I’d love to hear from you! 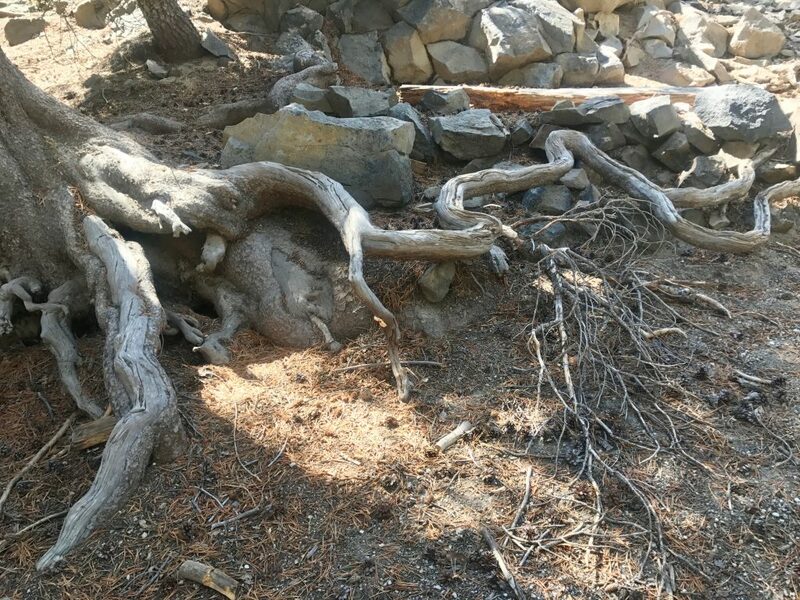 This entry was posted in Grammy Gets It, Lynn Kelley, Photo Challenge and tagged Devil's Postpile, Grammy Gets It, Lynn Kelley, Naked and Afraid, nature's art, survival skills, tree roots shelter, twisted photo challenge. Bookmark the permalink. It was amazing, and there were other trees like that, too. Really cool! I can’t say I’m much of a survivor, either, Yvette, but I’m learning a lot from those shows, just in case I ever need it, but I’m not much of a camper and I wasn’t a very good Girl Scout either! Haha! But, survival, I’m very interested in how people survived back in the old days without all the comforts of home. Thanks for stopping in! Those roots were probably once underground but rain exposed them. And yet the tree still continues to grow. Nice! I bet you’re right, Alex. Yes, it’s amazing that the tree continues to grow. Thanks for stopping in! Cool. Neat photos. And, yes, a very nice place to hide or hunker down. Thanks, Patricia! The wonders of nature, huh? Thank you for stopping by! Beautiful roots…amazing! I do hope you never have to find out how comfy they would be though. Thanks, Pambelina. I, too, hope I’m never in a situation where I’ll have to hunker down in the wilderness to test my survival skills!